“There will be front-wheel-drive BMWs in the smaller vehicle classes in the future,” BMW CEO Norbert Reithofer said at the company ‘s annual financial results press conference here today. 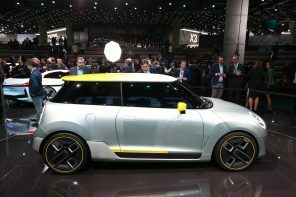 BMW expects the new architecture to debut in 2014 (a year later than anticipated) with the debut of the third generation MINI hatch. The new archicture will allow BMW to produce many products around the size of the current MINI and MINI Clubman and smaller. Basically everything from minicars to compacts. All told Automotive News expects the architecture to underpin up to 20 different MINI and BMW models. Previous articleBMW \”0\” Series Based on Front Wheel Drive MINI? Probably not a bad idea in the long run. RWD needs a certain amount of size 7 space. I’ve seen the 130i slammed in german comparison tests because of poor packaging and performance (compared to VW, Audi (S3) , and Mazda (speed3)). AWD, turbos, and transverse mounts are going to float some people’s boats in the compact area. From a BMW and sports car enthusiasts perspective ewwwww gross, lol front wheel drive is just straight up nasty! But…. I am getting a 335is with 7 speed double clutch so for the most part she’s an auto and many of you will poo poo that w/e. From an efficient engineering perspective it might be logical. I don’t know a great deal about automobile engineering other than giving the driving wheels direct control, reducing power loss, eliminating the long drive shaft, and rear differential I am not sure of the technical advantages over a rear wheel when it comes to efficiency. Why do I get the feeling that right now lots of BMW fans are letting out a collective groan. Kinda sad to see the move to FWD BMW personally, its a rather significant move from their history but likely one they felt needed to happen. I wonder how it will shift the perception about BMW’s. Then again a lot of BMW owners are ignorant which wheels drive their auto’s as they treat their lovely cars as appliances. We will not see this in the US until the next half of the decade (as I have been saying) and in the US it is very doubtful we will see anything smaller than a 1 Series (in name). Don’t be surprised that over the next few months you will hear about BMW once again trademarking some interesting number based names in addition to some more “drive” names. The next MINI will be a 2014 and the BMW will follow a bit later and just as the X1 has not hit our shores when it did in the EU these new BMWs will not as well. The marketing folks are already collecting opinion on the cars and will see how things go. BMW needs an answer to the A2, A1 A Class, B Class etc. In the end MINI just does not have enough market penetration for that as the styling is not for everyone- the BMW styling will be much more main stream. The other thing is these cars will be powered by 3 cylinders- hybrids, electric power with range extenders etc.. These will be departures from the current BMW offerings in many ways. Many have asked for cars to get smaller- just everything had to get bigger to fit these in under the current models. The FWD thing in the end will be the least of our concerns- the main issue will be if BMW can sell enough of these FWD models give us the RWD ///M cars we want, thanks to emissions and all the other regulations to take effect. I think this is a mistake. This makes me less likely to buy a BMW in the future. I thought they learned their lesson about going downmarket with their brand. They can sell all the FWD cars they want under a MINI label. Lets be honest, when you buy a BMW you expect some exclusivity. It is part of what makes the brand desirable. To Michael’s point…I have never ever heard one person say that they desire a more mainstream styled car. Ah well, there goes my hope for a small RWD / AWD 2002 sized sedan..
dr, I think what Michael meant was that Minis have some unique styling that some people may not like, especially the interior. Don’t get me wrong, I love Minis and their handling, but the interior can be a little funky to some people. These people would want a more “normal?” car. For me BMW’s are more normal cars than the MINI brand. Generally speaking people tend to like or dislike MINI styling. BMW is somewhat unique though overall styling in their prime market means a lot of manufacturers produce a similar looking cars (due to aerodynamics and jumping on each others band wagons when they find a successful design solution). I think Michael did mean that this would be a bit more conservative than the rather eclectic MINI desgn. My own repost… Made me say to the wife “BMW is going down the GM road! We should just buy a corvette next instead!” After the uncomfortable eye contact we both laughed it off. But this really truly has me worried! Why does BMW need to create a competitor to a product they already have? I understand platform sharing saves money but won’t it just hurt the other brand? Can not stomach the thought of a FWD BMW! I feel it will diminish the brands image! I also could be way off base and thinking emotionally and not rationally but I hate the idea of this! Yes- I meant BMWs are more normal and MINI is eclectic. 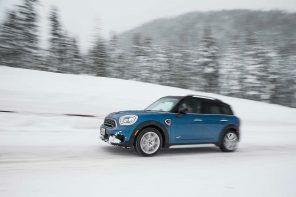 MINI has reached a saturation point by many accounts and for BMW to hit the next round of emissions numbers they need smaller more efficient offerings. This has more to do with that than trying to just cash in (obviously they want that as well). Business can not go on as usual bc of regs and oil use, BMW knows this they are the most sustainable car brand and they are adjusting as needed. Why does BMW need to create a competitor to a product they already have? I understand platform sharing saves money but won’t it just hurt the other brand? Can not stomach the thought of a FWD BMW! I feel it will diminish the brands image! I also could be way off base and thinking emotionally and not rationally but I hate the idea of this! Exactly! I have little interest in buying an Audi because it is a rebadged and over priced VW. I little interest in a volvo because it is a rebadged mazda/ford…and on and on. Clearly many of those brands exist just fine but they are just another car, bleh…If BMW goes down this road then they too just become another nebulous amalgamation of brands, labels and products that have no consistent overarching philosophy…..which at least used to be “The Ultimate Driving Machine”….which by definition is NOT FWD! The thing is they could still use the parts bin, and create a unique car. I’ll spell out my idea again. Use the Clubman platform since its on its way out of the Mini line up. This gives you a car with no direct platform match in the mini family. Use the R60 drivetrain to offer either AWD or RWD configuration. Package it as a small 2+2 coupe, with a trunk, boxy upright proportion, in the spirit of the 2002. The 2002 is a good precedent. I also like the Lancia Fulvia – nice proportioned small coupe although no back seat. I also like the Alpha 2000 GT, a nice small 2dr sedan. Something in this spirit, compact, practical, RWD, not another hatch back. They are not going to compete with inexpensive hatchbacks, so make it small and contribute good mileage to the corporate average, but be a hoot to drive. BMW = exclusivity? That must be a joke. BMW is just another mass production car maker, albeit an interesting one. For small cars, the advantages of RWD > FWD is very small. Considering that BMW is independent and needs more volume, this is a logical step. And consider that it needs to meet various emission standards. Those who cry foul – you are just a badge whore. Well, with government regulated standard of living (sorry, too good an opportunity not to say it) a cheaper, front-drive BMW sold on these shores may not be such a bad idea. All joking aside Americans are also downsizing into much smaller cars than before realizing that just because your wife is pregnant with your first child (qty 1) doesn’t mean you need to go out and buy a full-size, three row SUV. There’s really no reason a “0” series can’t be sold here, and any reason not to sell it this side of the globe would probably be justified by the myth of the exclusivity of the BMW brand. 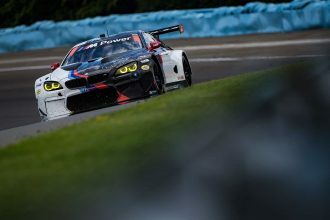 BMW RLL Wins Watkins Glen!